" YOUR IRIS GARDEN", "Plan it When the Irises are in Bloom"
The right time to plan the rearrangement of a bed of Bearded Irises is not when one goes to purchase new varieties in December, or when one starts to lift and divide up an old-established bed. To leave the choice of new varieties and new colour schemes until planting time is to rely on a memory of colours. Even when one has a keen colour sense and a good memory, it is next to impossible to avoid at least some mistake, and a single mistake in placing different colours, even if it does not jar badly, will bring a feeling of regret. Very often one hears the remark, "I wish I hadn't planted THAT variety against THIS variety," or "I wish I had placed a yellow or cream among that group. It would have lightened the whole planting." Such repining and regrets are easily avoided if one plans a little while the irises are in flower in November. If the bed is to be altered in its colour scheme, plan the alterations while you have the blooms to guide you. The modern Bearded Iris has such endless variations of both colour and tone. It is not enough to plan, for instance, to put a blue next to that pink. Decide while you can, WHICH blue will give the best effect. Done at flowering time the work of planning the new planting is not a task but an enjoyment. Even when it is not intended to lift and replant the whole bed, one often sees, if one takes the thought to look and compare, just how the planting may be made more attractive, by adding one variety to this corner, planting another lighter tone in the background, or removing one variety to another position. After all, colour is a very comparative commodity. We designate a flower "blue" or "pink." Place the blue against a white and it looks very blue; place it against another blue and it may appear lavender or purple. Again the pink may appear a true pink against a warm cream or a blue, but lavender against a salmon or pink and gold blend. Still again, in the matter of contrasts, a great deal of the ultimate colour effect depends on the TONE of the contrasting colours. Depth or lightness of colour tone is all important in producing colour symphonies. There are, of course, general rules to guide us, but these rules are far from infallible, and even if they do not lead us into pitfalls, it is just a matter of luck if we avoid that impersonal, characterless grouping one too often sees in garden colour colourful contrast, one must also keep in mind that 'Joanna' on the one side, and 'Golden Hind' on the other, will be in conjunction with other varieties. That is, perhaps, not so hard, but remember also, what is going behind, and what, if any, are going into the foreground. Tall varieties, as a matter of course, will go into background, where I have found it useful to remember to plant a good quantity of light or pale shades. 'Magnolia' (cream), 'Pink Advance', 'California Gold', 'Cedar' (pinky bronze), 'Golden Treasure' (light gold and cream), 'Pink Opal' (lilac), 'Miss California' (pink), 'Pale Moonlight' (silvery blue), and 'Winter Carnival' (giant flaring white) make ideal background varieties. Rich colours, such as 'Sierra Blue', 'The Red Douglas' (wine red), 'Richmond' (rosy carmine), 'Milson' (brown and crimson), 'Crimson Banner' (crimson), 'Dark Knight' (mahogany) and 'Destiny' (black-purple and bronze), being tall, must also go into the background, but should not be grouped together, but planted with the lighter tones to brighten and enhance their colours. The middle background gives the gardener the greatest scope, and the planning and selection here will give the main character and colour effect. This is the situation for the bright colours, and here one may let himself go with pleasing contrasts. Trial will confirm some surprisingly good effects. Not having thought of it, I was surprised to find Rangitikei and Inspiration very pleasing planted with 'California Gold', also 'Rangitikei' and 'Golden Hind'. Dark rich tones, such as 'Joanna', 'The Black Douglas', 'Destiny', 'Sable', require very rich gold’s to adequately lighten and display them, while light pinks, lilacs, light blues, and blends, look infinitely better if their foils are also light toned. In other words, in contrasts, light tones require light tones, and deep tones require deep tones in their contrasting neighbours. 'New Dawn', 'Mountain Lake', 'California Gold', 'Capri', and 'King Russet' are useful for lightening effects in the middle background. In planting blues and yellows in contrast, use pure yellows, the depth of tone of the yellow depending on the depth of tone of the blue. 'Brunhilde', 'The Black Douglas', and 'Joanna', for instance, require the deep gold tones of 'Golden Hind' and 'Coromandel', while 'Exclusive' (silver blue) looks very lovely with 'Magnolia' (cream), and 'Shining Waters' and 'Aline' (clear light blues) with 'California Gold'. In pastel groupings two or three medium-toned blues and pinks will give character to, without destroying the delicacy of the colour effect. 'Harebell' and 'Sandia' are excellent for this purpose. As varieties, even in the same colour class, differ greatly in their garden colour value, I will give here a list of varieties I have found most suitable for their respective purposes. They are good bases about which to build a planting plan. 'Magnolia' (the best all round background variety I know), 'Pink Advance', 'Dark Knight', 'Sierra Blue', 'Golden Treasure', 'California Gold', and 'Destiny'. 'Aline', 'Cardinal Wolsey', 'Golden Hind', 'Winston Churchill', 'Firelight', 'Lake Alice', 'Kapiti', 'Surprise', and 'Moonglo'. 'Inspiration', 'Richmond', 'Golden Hind', 'California Gold', 'Firelight', 'Naranja', 'Radiant', and 'City of Lincoln'. Brunhilde, Cardinal Wolsey, Rangitikei, Joanna, Golden Hind, Wellington, The Black Douglas, The Red Douglas, Red Dawn, Mrs. J. L. Gibson, Crimson Banner, and Beowulf. 'Magnolia', 'California Gold', 'Pink Advance', 'New Dawn', 'Angelus', 'Exclusive', 'Golden Treasure', 'Fair Elaine', 'Lagos', 'Los Angeles’,’Mountain Lake', 'Pale Moonlight', and 'Seduction'. It will be noticed that many varieties have double utility value. In conclusion, I should strongly advise the planting of a fair proportion of blues and yellows in any planting. Even if one does not care for yellow or blue as a colour, the omission of those colours from a planting of Bearded Irises will deprive the whole planting of its essential character, and the colour scheme will prove to have a sense of something lacking. Lake Alice, Richmond, Kapiti, Mountain Lake, and Red Dawn, all mentioned in the above article were hybridised by Jean Stevems and introduced by Stevens Bros in their various catalogues in the early 1940s when their nursery was located in the Rangitikei township of "Bulls". None of these cultivars appear in any checklists meaning they were not registered, perhaps the result of correspondence lost during the war years. When colouration is a consideration, this article is just as relevant today as when it was first published and is courtesy of the New Zealand Gardener, October 1945. Happy New Year to you all and a great way to start the new decade is with the Jean Stevens (nee Burgess) heirloom and historic tall bearded iris "Destiny". In 1928 using the rich purple blue iris with a heavy gold beard that Ferdinand Denis had named 'Aurelle', and crossing it with a iris Jean referred to at the time as ' The finest in our collection' the 1925 Arthur Bliss introduction 'Mrs Valerie West' It was a most successful cross and labeled E53 it produced a bumper crop of seeds totaling 88. From the planted seeds, seven Irises where selected for registration by Jean in 1934, the seedling registered as 'Destiny' having the most success. Her notes on the blooming in 1931 records the seedling 1/E53 as, S. deep fawn purple; F. rich dark purple nearly black, velvety; Substance exceptional; Shape good; L. 4 ft. Although it was registered in 1934, 'Destiny' was introduced to New Zealand gardeners commercially in 1932 and was first listed in the Waikanae Irises Catalogue 1932 for the princely price of forty two shillings with the following description: DESTINY, This is an exceptionally fine variety of our own raising and has been much admired in our own gardens. Standards deep purple, shaded fawn; Falls rich dark purple, almost black. this is a flower of great substance and good form 4ft. Mr Pilkington told us about this handsome and distinct iris, and when we saw it in bloom, we strongly confirmed the good opinion his enthusiasm had created. The standards are deep purple suffused bronze, and the falls are purple-black very velvety and of great substance. this is a hybrid of Mrs Valerie West and is the darkest iris we have seen yet. Height 4 ft.
Waikanae Irises, A.H. Burgess & Son, Irises 1935. DESTINY This iris a seedling of our own raising was shown at a Royal Horticultural Show in London in June 1934 where it created a sensation. 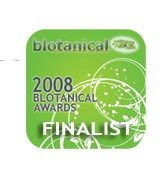 It was awarded a Bronze Medal by the Iris Society and was selected for trial at Wisley, the first award made to an Iris raised in the Southern Hemisphere.S. deep purple suffused bronze. F.purple-black very velvety and of great substance Late 21 shillings. The Iris Society Year Book 1938, Visit to Wisley. 10th June 1938', Geoffrey Pilkington. "I was interested to see Mrs Stevens (nee Burgess) DESTINY a Wisley carrying two very fine spikes of bloom. this is a superb Iris dark yet rich and attracts the immediate attention of the visitors. It does not seen to have acclimatised well in this country as yet, and the Wisley flower spikes where much better than any I ever grew of this variety. The judges will "Stop" when they see it next week." 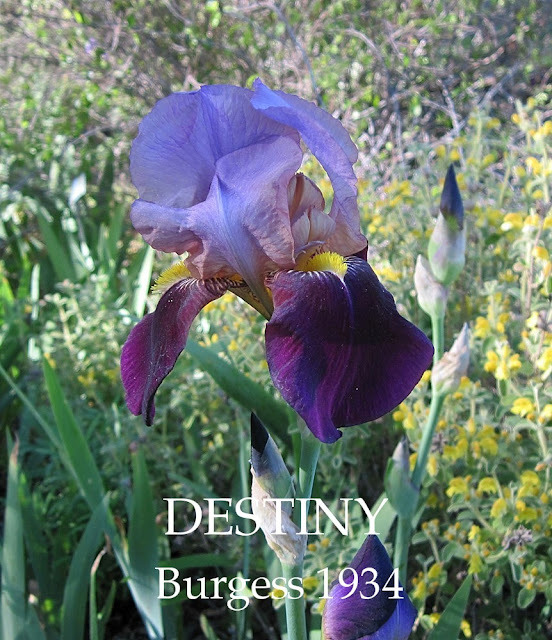 DESTINY Burgess 1934 M. 38" The antipodean origination which has made quite a name for itself in England; is a rich somber toned iris with exceedingly velvety broad falls of black plum purple coloring, deep purple standards and a rich gold beard. Destiny is especially effective in a garden when planted with 'Beowulf ' a complimentary color in maroon. A great heavy flower of deepish blackish bronze purple, the beard a rich golden bronze. From New Zealand and credit is due to its originator for having made it possible for American gardens to enjoy such an outstanding iris. It has all good points- excellent form- tall stems and succeeds everywhere. Stevens Bros, Bastia Hill, Wanganui. Irises 1957-58. New Zealand Iris Hybridiser's Cumulative Checklist, 2010. DESTINY Miss E.J. Burgess, R.1934. Sdlg. 1/E53 TB, 48″, M-L, S9D. S. deep fawn purple; F. rich dark purple nearly black, velvety; Substance exceptional; Shape good; Description E.J Burgess Studbook notes,‘1928 flowering’; Aurelle x Mrs Valerie West; Waikanae Irises 1932; Orpington.1934;1938. Bronze Medal, I.S.(E.) 1934; Yr. Bk., I.S.(E.) 29. 1934; A.M., Reg., R.H.S. 1938; Yr. Bk., I.S. (E.) 44. 1938; 10A. 434. What is amazing about this Iris is that it is widely grown correctly labeled overseas.' Destiny' is still catalogued as growing in R.H.S garden collections in Ireland and England which has been confirmed, but only a few grow or know they are growing this iris in New Zealand. The above photo was sent to me by Phil Edinger who has proudly grown 'Destiny' in his California gardens for many years. Phil is the Historic Iris Societies I.D. Chair which removes any likely-hood of the Iris been incorrectly named by others.